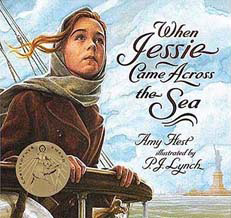 When Jessie Came Across the Sea tells the story of 13-year-old Jessie, who lives in a small Eastern European village with her grandmother until one day she is given a free ticket to America. She's sad to leave her grandmother and frightened to go alone, but she knows it also means more opportunity for her future. As this book is for older children, the text is a bit longer on each page, allowing for a more developed story. This book is a good length and we particularly like the span of this story, from her life before departure to her life once settled in her new home. 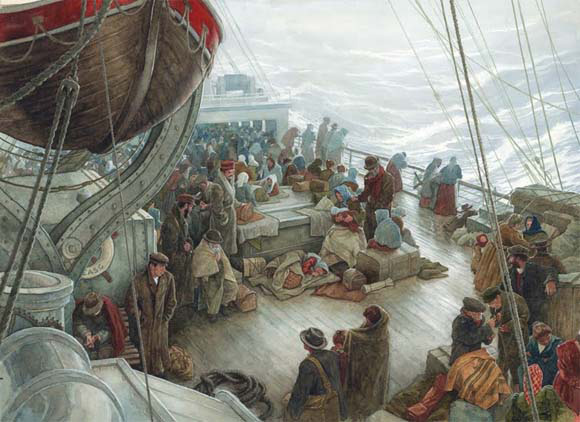 Many children's books about pioneer stories or early immigration stories focus almost entirely on the journey. We like that this book continues on to share what her life was like, making it more engaging and more useful in US history units. P.J. Lynch's goache and watercolor paintings are absolutely beautiful and luminous--a perfect accompaniment to the story. Each spread captures the drama of the immigrant experience and all the emotions that this young girl is feeling. I wish I could have them as posters for my walls, particularly the group when they first see America. You will be captivated, and so will your students. 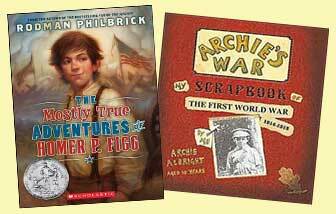 Winner of the Greenaway Medal and the Parent's Choice Gold Award in 1997! Here are sample illustration from inside this book. Every page of the book is this stunning. When you read it to your students, take your time. Let them savor these breathtaking images full of historical details.